French fashion designer Pierre Cardin had designed a Light Palace for Venice, which is close to where he was born. The Light Palace, or Palais Lumière, was planned to be constructed on the edge of the Marghera industrial areas bordering Venice’s lagoon. Nevertheless, the same article quoted Rodrigo Basilicati as indicating that the financial package for the Palace was on course. However, Venice Mayor, Giorgio Orsoni, indicated that he would challenge the necessity of this permission and the local Superintendent in the Venetian newspaper Il Gazzettino di Venezia on 5 December 2012 here: Torre_vincoli_Gazzettino. According to this article, Orsoni would consult a local teacher of administrative law for advice. Orsoni stateed that local legal restraints only apply for hydraulic reasons and not for landscaping issues. Moreover, Orsoni asserted that if such legal restraints were applied, half of the nearby city Mestre and Marghera’s industrial areas would be paralysed. As is often the case in Italy, there were complex legal issues at stake. The Galasso Law of 1985 states that each region can decide where it is possible to build 300 metres from the sea or 150 metres from rivers or streams. Yet the Galasso Law has always excluded the Marghera industrial areas and Mestre. Soragni refers to the first article of 142 of a national heritage decree in 2004 that forces all regions to accept these limits if the region has passed a landscape plan. But the Veneto Region has not yet approved such a plan, suggesting that the Veneto is not currently subject to these limitations. Earlier, the Light Palace received the backing of many local government bodies. It received the approval of Venice City Council on 24 July 2012, with 28 votes for and 3 against it. In addition, Zaia, the President of the Veneto Region, endorsed the project as “a great opportunity for development, publicity and culture”, as reported on 24 July in the Venetian newspaper Il Gazzettino di Venezia here: Il Palais Lumière è sempre più realtà: il consiglio comunale dà l'ok al progetto. The project team members had hoped to receive the necessary approval so that they could move to the stage of the Light Palace becoming an “executive project” by March 2013, but this was delayed. The team expected most work on the Palace to be completed in 2015. The environmental impact investigations announced in March 2013 made this date optimistic. Ultimately, whether Venice’s Light Palace would have been regarded as an eyesore is a highly subjective question. I was in favour of the Light Palace as a symbol of Venice embracing modern development and as part of the transformation of Venice’s mainland and Marghera, which is explained in my book Venice in Environmental Peril? 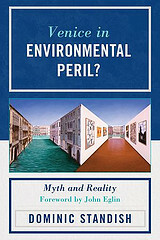 Myth and Reality (2012). Indeed, the green light for the Palace by ENAC came along with approving a new runway for Venice airport and additional development of the mainland area close to the airport, including the construction of a football stadium, casino and planting a new wood. Further details of the project were described on 19 June 2012 in the newspapers Corriere del Veneto (click here: Palais_dettagli_Corriere) and in La Nuova Venezia (click here: Palais_dettagli_Nuova). The cancellation of this project eliminates an opportunity for Venice and its economy to grow in tough economic times. It suggests that the forces of environmental precaution and bureaucratic lethargy still prevail in the city. Some bureaucrats and environmentalists will be celebrating. But those of us who want to develop the city and region so that the local people can live better lives will continue to fight for modernizing, rather than restricting Venice. This kind of project only symbols and the effects for the people in Venice (Historical centre) are disastrous. This kind of urban development is a child of the 80th! 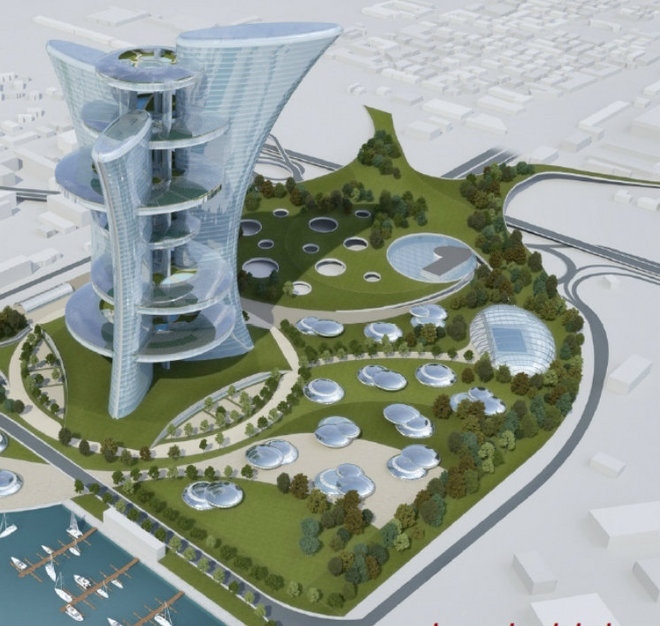 Better give the money into a masterplan for the whole Marghera Harbour and stop this stamp-like politics. Actually, symbols are important for Venice and many cities. Can you define and explain ‘disastrous’? I agree the whole of Marghera needs transformation, so surely we should welcome this project as a step in the right direction? There was opposition to the Eiffel Tower, to the Pyramid at the Louvre, also against the Ferris Wheel in London, St Pauls Cathedral London and on goes the list. Most mountains in the world would be vehemently opposed if the general public had a say in it. Trees are constantly falling victim to chainsaws and deemed unnecessary blots on the landscape. This concept for Venice is an opportunity that should be embraced. Joseph Carnegie said, “A man who dies rich dies in sin”. Monsieur Cardin is a generous philanthrope, so let the light shine in. Great comment, Finnbar; this is important comparative and historical context.